If it’s one thing I’ve learned to appreciate during my tenure in California, it would have to be Mexican food. Los Angeles has opened my eyes to probably the best Mexican food in the country – so when I heard Rick Bayless had decided to expand in our city, my interest was piqued. It’s not a restaurant that is Bayless’ so much as one thatÂ has consulted him on the menu and brought a lot of the elements of his Chicago restaurants directly to Melrose – but good enough. It has his name on it; I’ll take it – and thank Executive Chef Michael Brown in the meantime. When I travel to Chicago, Mexican food and seafood are cuisines I flat-out avoid (celebrity chefs aside). I was curious to experience first-hand his approach to it, however, and I’m happy to say that it didn’t disappoint. In fact, the food was inspiring – a large partÂ made possible with the quality ingredients thatÂ I imagine are much more accessible than in ChicagoÂ – and the ambiance of the natural, modern space completed an overall enjoyable dinner. Price points were reasonable, save for the “Mexico’s Celebrated Seven” – which, if you should want to get committal at Red O, include an achiote-marinatedÂ Gleason Ranch suckling pig, a spicy green chile-marinated Creekstone NaturalÂ rib-eye. But the important thing was that the flavors were as vibrant asÂ Mexican fareÂ should be. Dark sauces, light sauces, pork belly, chicken, duck, steak dishes were all solid – butÂ you might laugh if I told you that the tortillas were good.Â Don’t, because this ground level ingredient isÂ so often overlooked, and Red O passing the test allowed me to appreciate the actual dishes with a keener eye. 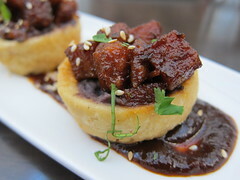 The pork belly sopes were the sweet kind of delicious, with the salsa negra giving it good depth. 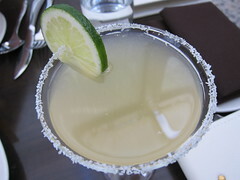 I could see myself at the bar with a tray of these, washed down with their Topolo Margarita (Sauza Conmemorativo tequila, Gran Torres orange liqueur and limonada) – the only straight-up cocktail on the menu at the time of our visit. The cocktail menu is actually being revised right now, which is a good thing since I thought every other drink was too easily bruised by the ice, having started off with not enough flavor. Or, perhaps, liquor. 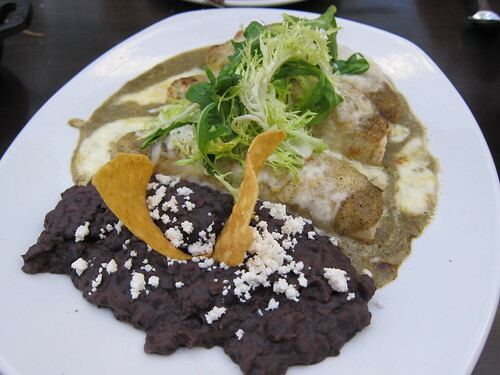 Other favorites of mine included the Crab & Shrimp Enchiladas, served with perfectly cooked black beans which countered the slight saltiness of the crab and shrimp inside the blanketed enchiladas. The tomatilloÂ with its slight smoky flavor was delicious as was the melted cheese – and the texture was tender, not soggy and I was happy with the ease ofÂ forking each bite into my mouth. 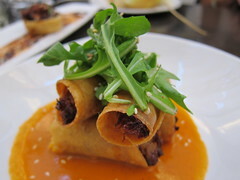 The duck taquitos were also a hit, with the slow-cooked,Â rich bird filling out their crispy-on-the-edges, tender-on-the-inside rolls of corn-shelled tacos. The argula topping was a nice touch to the mild tomato-arbol chile sauce – while letting the duck be the centerpiece of it all. The lamb (title picture)Â – a meat that I can really get behind if prepared correctly – was perfect for tacos, as well. 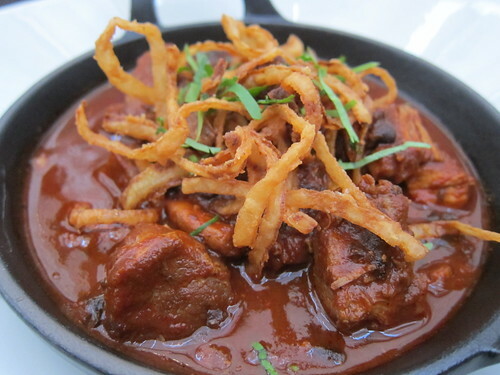 It was extremely tender and very approachable for those who don’t normally like lamb. I really liked the chile broth in this one – plus, who doesn’t like garlic? I appreciated that there were fried onions added, giving a crispyness to the dish that most wouldn’t think to include. 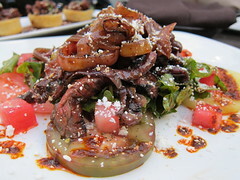 Another favorite of mine was the steak and heirloom tomato salad – and as if the tomatoes weren’t enough, there were vacuum-prepared, cubed watermelon added to the mix to make it an extra refreshing plate. The steak was super tender and perfectly pink in the center of each cut. I could also order this at the bar if I felt like a light but delicious meal…and a cocktail. Fortunately, the modernized Mexican foodÂ made with quality ingredients isn’t everything to be desired – the ambiance matches the mantra. 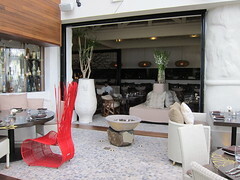 The space, designed by Gulla Jonsdottir, was superbly thought-out and crafted. It made great use of natural light when available during the day – with the option of an automated closing door on the open space “indoor” patioÂ if need be. You won’t see any heat lamps at Red O, because there lay heating coils underneath the stone-grout floor to keep all diners comfortably warm without the overhead glare of a gas-powered metal fixture. Perfect. 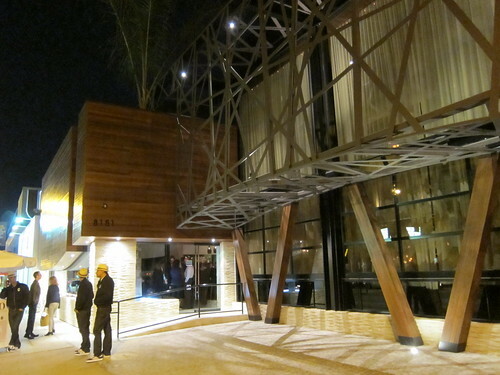 Also, it was revealed by Gulla that the steel and woodenÂ wrappings of the restaurant on the outsideÂ represent that the restaurant is a gift to Los Angeles – as if from Mexico. It really is a beautiful space, inside and out. And I must not forget to mention the tequila hall. It’s a visualÂ haven for any tequila drinker, surely – but I couldn’t help but notice that I was singularly inspired by the small batch of Jose Cuervo Extra Anejo with its hand-written bottle number. It reminded me of Scotch in the best way possible – tasting more notes of wood than actual agave. 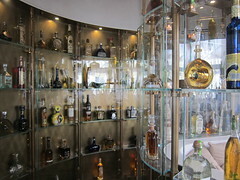 But the other tequilas in the flight (Corralejo, Don Julio), I had learned about from my tequila-drinking ex-boyfriend and soÂ the selectionÂ left me wanting to continue my education inÂ small batch tequilas from just across the Southern border. Apparently, the tequila list had been imported directly from Chicago; we’ll see if that gets revised along with the cocktail menu. This entry was posted in cocktails, Food, Melrose and tagged Chicago, cocktails, cuisine, Food, los angeles, Melrose, mexican, New Mexican, Red O, Rick Bayless, tequila, tequila tunnel. Bookmark the permalink.